Perry Rhodan's range of sci-fi models has being running since the early 60s and the expertise gained in this field over the last 40 years is obvious in the Blues Ship model. 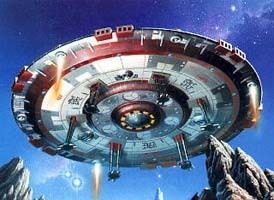 The craft itself is very much in tune with popular traditional views of old flying saucer style UFOs. This model is not for the novice model maker and has a mid-level rating which should attract the experienced modeller who wants a fairly easy model to build. This would make an excellent gift for a science fiction fan and it is good to see that Perry Rhodan is keeping up the great reputation it has built up over the years. The only complaint is that it looks, at first glance, to be a little simplistic and you could be forgiven for thinking that more effort could have been put into its design. But once you start work on it it is apparent that a great deal of thought has been given into their design. A nice model that should give most model builders several hours of fun.